Do you want to look like a real minder and do feats that defy explanation, unless you could really read minds? Without having your spectators write anything down at any time. Then this release is just for YOU! These are three Jason Michaels effects that have not previously been released. These were Jason's prime bread and butter effects that appeared to be real mindreading. They were used in newspaper offices for reporters all over the country. There are no gimmicks used. No math principles or fishing techniques used. 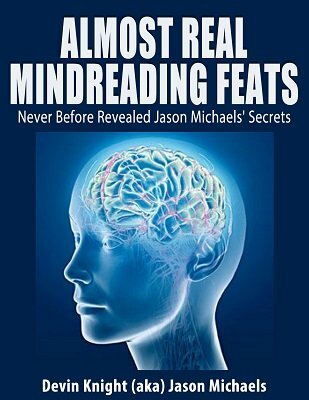 These three effects convinced the skeptics and reporters that Jason was a real mind reader. All are impromptu and can be done on the spur of the moment when someone comes up and says do something. These are effects that you can't get caught at or exposed. All three are as close to real mindreading as you can come. THINK OF A HAND: This is not the old raise one hand while the performer's back is turned and he looks for the paler hand when he turns around. This is an entirely different method that will puzzle most magicians and fool any lay person. The performer holds both wrists of the participant's hands. He asks the person to think of either his left hand or right hand. With no questions, the performer immediately tells the person which hand he is thinking of. This may be repeated immediately to show it was not just a lucky guess. Now hear this, if the person changes his mind and thinks of the other hand, the performer knows this and tells the person, that he changed his mind just like a real mind reader would. Jason did this hundreds of times and never failed. A little-known secret that you can learn. Easy to do. Do this anytime someone comes up and says, "Read my mind." No gimmicks, no pumping, just a clever technique that lets you know which hand the person is thinking of. CHALLENGE THINK OF A CARD: A participant removes any five cards from his shuffled deck. The performer need not see the faces of the cards. The participant holds the five cards in a fan, with faces towards himself. He is then instructed to just mentally select one of these cards in the fan. Without the aid of a stooge or plant, the magician reaches over and removes the very card that was just thought of! This may be repeated and the performer is always correct. THE 52 NO FISHING CARD CHALLENGE: This was Jason's favorite mental card effect and is worth the price of this PDF. A person is asked to think of any card in the deck, asking the person not to think of the obvious Ace of Spades or Queen of Hearts. This is a free choice and not a force. The person just thinks of a card and DOES not remove it from the deck. He does not look at a deck to think of a card. He just thinks of it in his mind! With no questions, the performer puts the face down deck behind his back, WITHOUT LOOKING AT THE FACES and brings one face down card forward. He asked the person to name the card he just thought of and turns it over. It is the same card. Baffling beyond words. No sleights and almost infallible. This is something you will use. Looks like real mind reading. Two different methods given. Complete details complete with photos that teach you step by step how to accomplish these reputation making feats of almost real mindreading. 1st edition 2008, 16 pages.